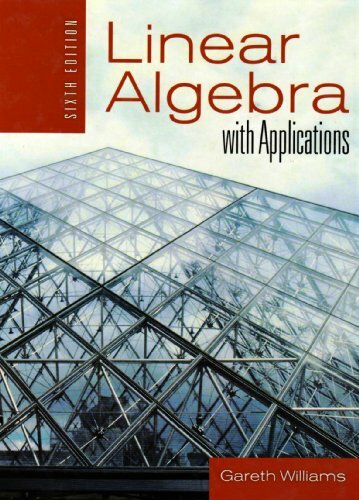 Linear Algebra with Applications, Sixth Edition is designed for the introductory course in linear algebra typically offered at the sophomore level. The new Sixth Edition is reorganized and arranged into three natural parts that improve the flow of the material. Part 1 introduces the basics, presenting systems of linear equations, vectors and subspaces of Rn, matrices, linear transformations, determinants, and eigenvectors. Part 2 builds on this material, introducing the concept of a general vector space, discussing properties of bases, developing the rank/nullity theorem and introducing spaces of matrices and functions. Part 3 completes the course with many of the important ideas and methods of Numerical Linear Algebra, such as ill-conditioning, pivoting, and LU decomposition. New applications include discussions of linear algebra in the operation of the search engine Google and in the global structure of the worldwide air transportation network. Clear, Concise, Comprehensive - Linear Algebra with Applications, Sixth Edition continues to educate and enlighten students, leading to a mastery of the mathematics and an understanding of how to apply it.